You guys — Thanksgiving is nearly here!!! Who's excited? I know I am! *Also, some unsolicited life advice: never do long distance. Just don't do it. For the last few years, Erlend and I have always celebrated Thanksgiving in a very non-traditional way. We usually opt to roast a duck instead of turkey, and choose an accompaniment of Asian sides from the Pok Pok and Momofuku cookbooks instead of the usual stuffing, cranberry sauce, potatoes, etc. This year won't be any different — Erlend will likely roast another duck using Mandy's kickass recipe, and I'm preparing some mushroom and toasted rice cake salad sides from the same two cookbooks from last year. Because we've always celebrated Thanksgiving our way, it occurred to me that I've never really made the classic Thanksgiving dessert of pumpkin pie. I mean, I guess there was this chocolate pumpkin pie from a few years ago, and, while it was tasty, you can't really call a chocolate pumpkin pie traditional and classic. Because traditional pumpkin pie is pumpkin spice custard in a glorious, buttery flaky shell, period. No substitutions, no alterations, etc. And this year, it was time for me to make one. But then as I started researching recipes to find the true classic, I kept seeing variations and adaptations that really called out to me instead. 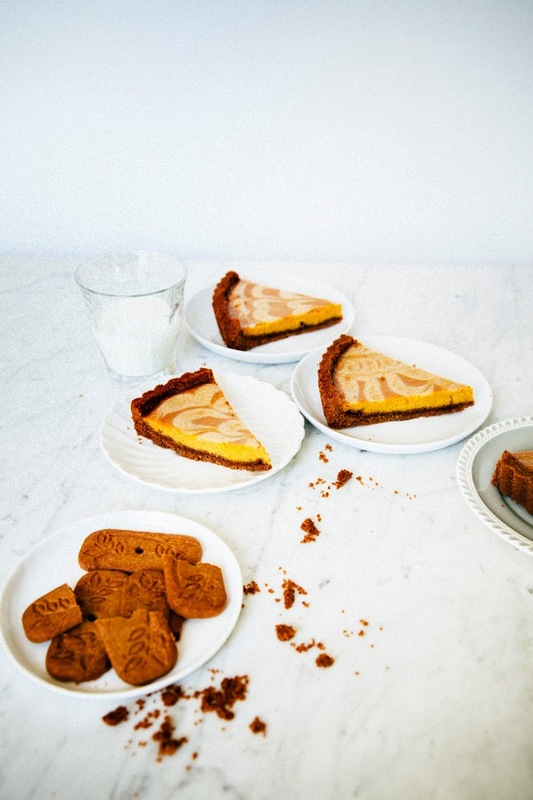 Things like a ginger snap cookie crust instead of an all-butter one, pumpkin custards swirled with other flavors, etc. Before I knew it, I found myself whipping up something that wasn't really the traditional thing at all. 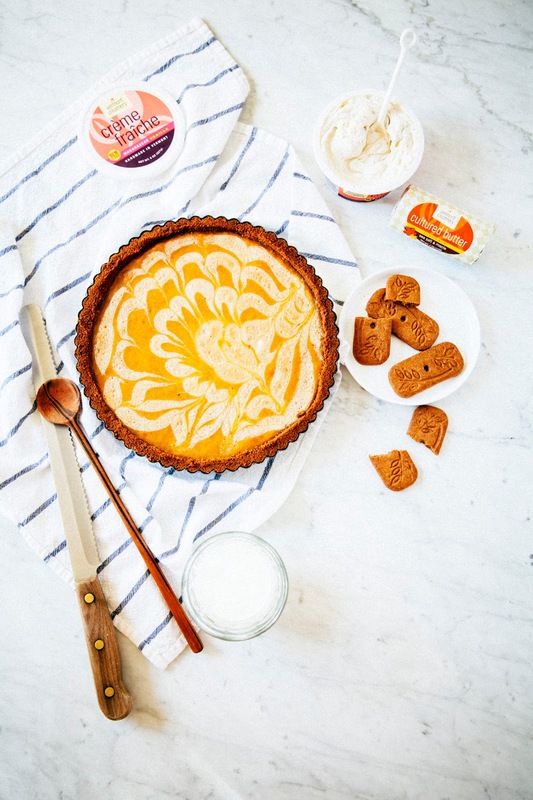 Instead of a traditional pie crust, I'd taken inspiration from all the ginger snap crust recipes but instead used speculoos (the Dutch spiced biscuits that seem to be all the rage at Trader Joe's). Also, instead of using a traditional pumpkin custard recipe, I borrowed a step or two from my favorite key lime pie recipe and instead mixed the pumpkin with sweetened condensed milk for a creamier filling. Finally, I swirled Vermont Creamery vanilla bean crème fraîche through the custard. Because truth be told, I recently found myself watching latte art competition clips on YouTube and was inspired to make my own creation. But, ya know, with pie instead of espresso, and crème fraîche instead of cream. I was going for a turkey to fit with the theme of Thanksgiving, but really it looks more like a daffodil. Or random swirls. Or whatever. Eitherway, it doesn't really matter, because it's delicious. If you haven't had crème fraîche yet, GET ON IT, because crème fraîche is basically a milder, subtler sour cream that works in a ton of desserts. Use it in place of sour cream, whipped cream, as an accompaniment, as a topping, whatever! 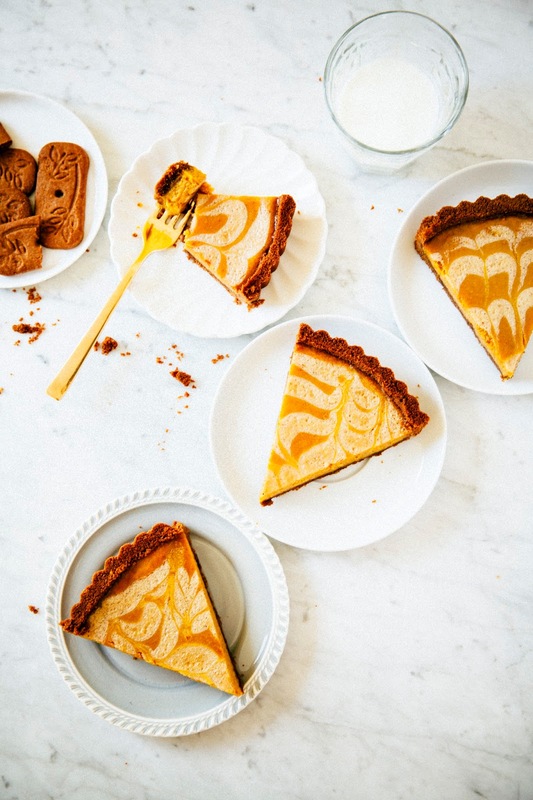 Because of its slightly tart flavor, it works especially well with sweet desserts like this pumpkin pie. And a special Thanksgiving treat, I'm giving away a Vermont Creamery goodie package (valued at $150) chock full of their vanilla bean crème fraîche, amazing goat cheeses, and cultured butters! Use the widget below to follow both Hummingbird High and Vermont Creamery on Instagram to gain contest entries — even if you already follow me and Vermont Creamery on Instagram, you'll still need to confirm that you do via the widget. The giveaway ends on November 23rd at 11:59 PM and is open to U.S. and Canadian residents only. Thank you all for participating! The giveaway is now closed. Congratulations to Melissa S! Thank you to Vermont Creamery for sponsoring this post by providing the compensation and ingredients to make it happen. I'm working with them all month to provide crème fraîche dessert recipes — check out last week's recipe for a red velvet cake with crème fraîche frosting. As always, all thoughts and opinions are my own. Thanks for supporting Hummingbird High and all my sponsors! Vermont Creamery vanilla bean crème fraîche is available at some Whole Foods Markets; however, their regular crème fraîche is available in ALL Whole Foods Markets and more widely available in other major supermarkets like Safeway, Kroger, and Wegman's. Although I use the vanilla bean version for this recipe, you can easily substitute it with their regular crème fraîche for the same results. I also used Vermont Creamery's maple and sea salt cultured butter, which I found gave the cookie crust a subtle maple flavor. However, you can also use regular unsalted butter. Speculoos is available in most major supermarkets, especially Trader Joe's. You can also purchase Biscoff, the branded version, online. In a pinch, you can also use ginger snap cookies, but you'd be missing out on that special speculoos spiced flavor. This recipe works best if you use a 9-inch tart pan with high sides (around 2-inches) and a removable bottom; I used this one from Nordic Ware. 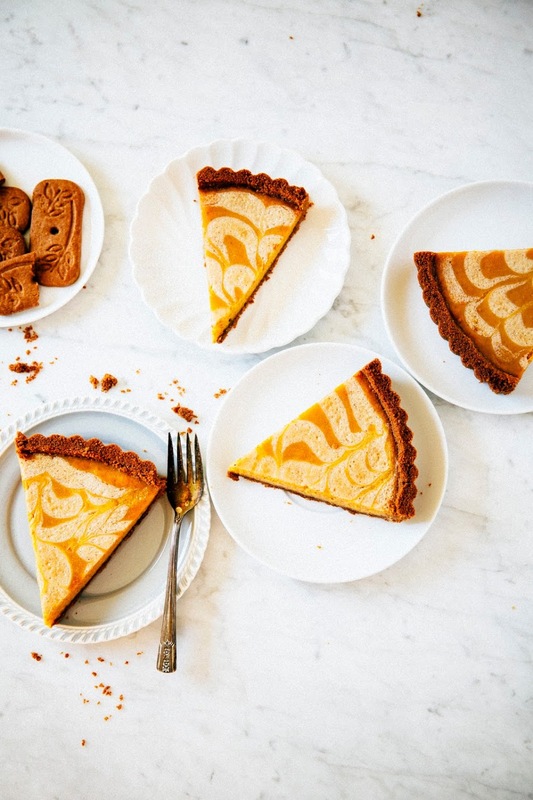 You can also use a regular tart pan (most regular tart pans only have sides that only go up 1 inch or so), but you'll likely have extra speculoos cookie crumbs and pumpkin custard. To get the swirly latte effect on the pie, I transferred crème fraîche into a piping bag and piped a pattern into the pumpkin custard, which I then manipulated with a sharp bamboo skewer to get that turkey/daffodil effect. It sounds complicated and impressive when I say that, but it's really not — Food52 has a great, visual guide that shows you the different marbling patterns you can achieve using this same method. In a food processor, combine 10 ounces speculoos cookies, 1 tablespoon dark brown sugar, and 1 teaspoon kosher salt. Pulse together until coarse and well combined. While pulsing, stream in 1/2 cup melted butter and continue pulsing until the crumbs come together in giant clumps. Use a rubber spatula to transfer the crumbs into a 9-inch tart pan with high sides and a removable bottom — there's no need to grease the pan. Use your fingers and the back of your hands to press the crumbs onto the bottom and sides of the pan, creating an even layer. The bottom and sides of the crust should be around 1/4-inch thick. 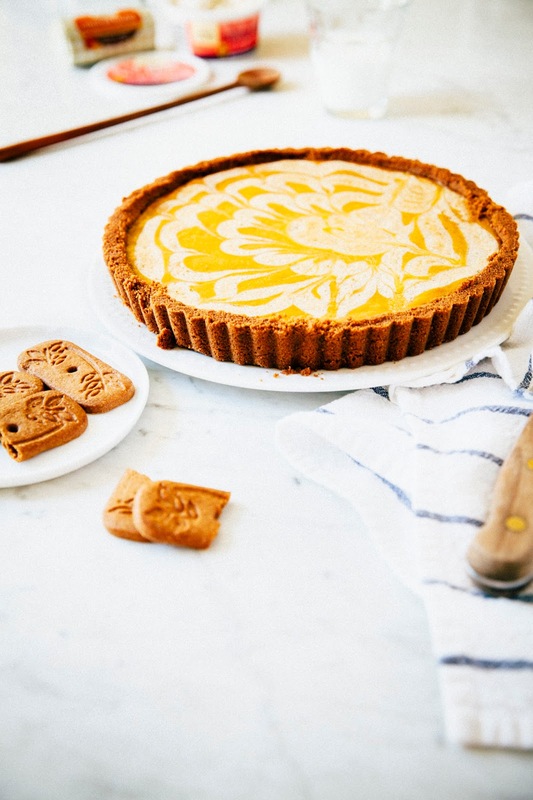 Once the eggs are fully incorporated, pour the mixture into the prepared cookie crust shell. Transfer 2 ounces crème fraîche into a piping bag (or, in a pinch, a Ziploc bag with the corner snipped off) and drizzle the crème fraîche over the mixture in the pattern you desire (you can use this awesome Food52 guide for a quick tutorial on marbling). Use a bamboo skewer or toothpick with a sharp point to swirl the crème fraîche across the filling. Bake for 35 to 40 minutes in the preheated oven, or until the edges of the filling have set. The filling may have bubbled and puffed slightly in the oven, but don't worry — it settles down as it cools. 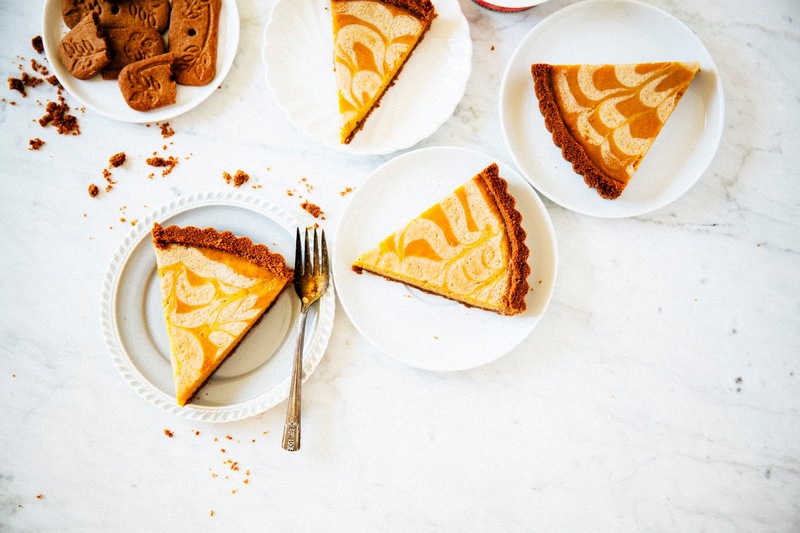 You can use a knife to tap on the sides of the tart pan to test the filling; the middle should wobble slightly, but the edges should stay in the same place. Be careful not to overcook — it's better to pull it out of the oven earlier than later, as the filling will continue to cook after it's pulled out the oven. Transfer to a wire rack and cool completely until fully set. Serve at room temperature, or chilled for an hour. This pie is best the day it's made (since the crust will remain crunchy, but will soften the longer it sits).